We're currently watching the "Clinton Cash" scandal unfold about the Clinton Foundation. The Clinton Foundation looks like it was set up as a global lobbying firm to personally benefit the Clintons, with a little bit of charity, about 15% of the donations, thrown in. While Presidential candidate Hillary Clinton was in her powerful and influential Secretary of State position, there's a timeline of President Clinton's speaking fees escalating and lots of money exchanging hands, some of it very questionable, the timing questionable and some of the people involved very questionable. Are we getting numb, annoyed, agitated, frustrated or angry when we continue to see money buying access and influence with those in powerful or elected positions. Closer to home let's look at the money trail of those associated with the GoHillsborough campaign. We previously posted here that the cronies were put in charge of the million dollar taxpayer funded public engagement effort when it was handed over via a no-bid contract to Parsons Brinckerhoff. Who were some other donors to MHF? Parsons Brinckerhoff, Beth Leytham, Chappell-Roberts, Jacobs Engineering all donated, some very substantially, to the Moving Hillsborough Forward pro rail PAC. They are now all getting YOUR tax dollars to run the GoHillsborough campaign. Commissioner Hagan stated he voted to put the 2010 referendum on the ballot because he wanted the people to vote on the issue. They did by overwhelmingly voting NO. Hagan's ready to put another sales tax referendum on the 2016 ballot - as we reported here. Hagan has even indicated he may exploit a term limit loophole to jump back into his District 2 seat to enable him the opportunity to remain a county commissioner until 2024. While anyone can contribute to any candidates race they choose, we do take note of who the very first donors to Commissioner Hagan's 2014 re-election race were when he filed to run again for his countywide seat in February 2013. The very first day of donations reported was 2/26/2013 and the very first donor, after Hagan himself, was PR consultant Beth Leytham. In fact, she donated twice in one day, as an individual and from her business. Leytham is getting almost $300K of our tax dollars via the million dollars the county handed to Parsons Brinckerhoff for GoHillsborough. Chappell-Roberts, the ad agency with close ties to special interest Tampa Bay Partnership, owns the GoHillsborough.org webite and was engaged by Leytham to do work for the GoHillsborough campaign. How coincidental is that? And Hagan and his war chest ran unopposed in 2014. To request the County Administrator to negotiate a contract with the strategic planning consultant for services related to the formation of a policy group and to assist in preparing and facilitating a series of workshops for this group to develop a transportation strategy which will be integrated into the Boards strategic plan, economic development/redevelopment areas and recommendations 1-10 of the Economic Prosperity Stakeholder Committee. How did the above motion to have a series of workshops to develop a transportation strategy that would be integrated into the county's strategic plan, turn into a million dollar taxpayer funded GoHillsborough campaign? Follow the money. The GoHillsborough campaign is spreading our tax dollars around to cronies. I got a copy of the Parsons Brinckerhoff invoices submitted to the county for payment. They include what Leytham, a subcontractor, invoiced Parsons. From October 2014 through January 2015, Leytham invoiced Parsons $168,805.76. That's 60% of the $281K total she will be getting for her GoHillsborough work. Below is the breakdown of those costs. 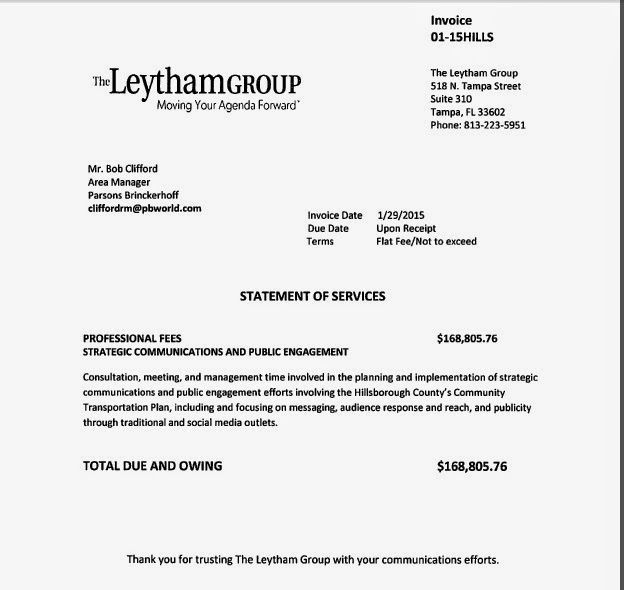 We heard Leytham was trying to state she was only getting $75K for her PR work. If she said that, obviously that's not true. Leytham's being paid almost $74K for branding and creative design. We reported here that Leytham simply hijacked the GoHillsborough brand name from the transit lobbyists Connect Tampa Bay's plan of the same name they proposed last year. Hijacking a name is not creative, doesn't take much effort or should not cost much. The website is a standard template that doesn't have any cool or unusual attributes. We're paying $15K for Facebook ads that's resulted in about 2300 Likes on their Facebook page. Is that considered successful? GoHillsborough's twitter handle has under 250 followers and has tweeted a whopping 39 times. We're paying Leytham $80K for focus groups, market analysis and benchmarking polls. Where are the results of any of those activities and how are they being used in this campaign? Does this look more like an expensive taxpayer funded PR boondoggle? Parsons Brinkcherhoff is known for getting referendums on the ballot, then donating heavily to the pro referendum special interests campaign and then benefiting by getting projects created by the sales tax largesse. Leytham is very closely associated with Commissioners Hagan and Mayor Buckhorn who are both members of the Transportation Policy Leadership Group. She's a political insider who is now a taxpayer funded political insider with plenty of access. Leytham can now use her close relationships on the inside to lobby or pressure others to support another sales tax referendum - all on our taxpayer dime. If there's a referendum, Chappell-Roberts can just turn the GoHillsborough advertising campaign over to the Tampa Bay Partnership to run the private sector campaign again. This is a very cozy group of folks who have created a circular money trail. Has the inside lobbying already begun? We don't know. But we do know Commissioner Hagan, Mayor Buckhorn and Commissioner Miller want another sales tax referendum in 2016. They want another big pot of your hard earned money before ANY plan(s) have been discussed, before we know what this new tax would pay for or before we know what the costs involved are. Must we have a referendum before we know what's in it? Sound eerily familiar? Like the Clinton Cash, follow the GoHillsborough money trail. They are both circular.